I love this watch and I wear it a lot. I purchased a gold one also and would definitely purchase another one for a friend. It functions well also. This August Steiner women's watch features a unique dial with a sparkling studded heart. The Swarovski crystals bezel and elegant satin strap makes it a definite eye catcher. The luminescent hands and date display makes it practical for everyday use. Most women's watch bands can be sized to fit 6.5 to 7.5-inch wrists. Dimensions 4.0 In. X 4.0 In. X 2.0 In. I bought this because my other watches are all silver toned. The rose gold version is stunning. If you have older eyes, you have have trouble reading the small date. It looks like it's worth many times the price. I wear it with very high end pieces. You would never know that I didn't pay full price. Elegant and classy. I do not like the watch bands so I changed them to leather without the satin. I do not know about the quality yet. I had to return one that was not working. I purchased the brown band which has a golden cast. It can be worn day or night. I have gotten countless compliments. The piece keeps perfect time and is so light that I don't know it's on. The only downside is that the heart obscures the date and I am unable to use the date component. i purchased the gold satin watch for my wife. She absolutely loves it! She wore it to bed, not realizing she was still wearing it. The date is too small to read, but the watch is beautiful. The watch feels good around your wrist, very nice size, just adorable watch. I bought 3 of the, one for me, my sister and my cousin. Were great Christmas gifts. This watch is beautiful and very expensive looking. I purchased the brown band. Wish I could have gotten the red as well ! 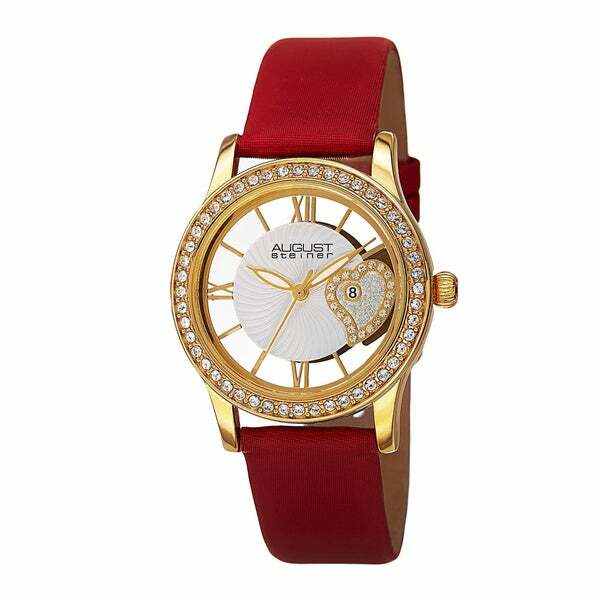 Elegant Gorgeous watch~you will love it! I have had two of these watches for over a year and still am so impressed how gorgeous they are!!! Elegant with beautiful quality crystals that have an amazing sparkle. I love this watch,it's gorgeous and so rich looking. Bought it for my girlfriend for Christmas. She took off her $300+ watch and started wearing this one. She really liked the heart design within the face of the watch. Wonderful watch for the price. I love an August Steiner watch I have bee wearing. Easy to read and useful for every day. My daughter loves it. The price was great. One of the best gift that I could have purchased to put a smile on my daughter face. The watch is beautiful. It looks very expensive. Gave it as a Christmas present and she loves it. I love this watch! It keeps great time and is quite fashionable. I purchased one with a bronze colored band which goes with most colors. The numbers are large enough to be easily read. I have worn it for quite a while and it really is holding up well. Great looking watch. It is very elegant and will compliment any outfit, dressy or casual. I highly recommend this watch. One of my favorite watches. Thank you for having a large inventory and quality products. this watch is OK the band got dull after a few times I've worn it. "Can I get this in red ban"
Hello Push 762, I'm sorry that option is sold out. Please check back soon. Have a great day! "Hi, do you have this watch in Red color strap?" Hello Ajay, Unfortunately currently the red band watch is out of stock. Items are restocked as they become available; however, we cannot guarantee an item will be restocked. Thank you for shopping with us. "Does this watch come with an August Steiner box?" Hello Curt, this is a beautiful watch! We do apologize, we cannot guarantee this item will arrive with a August Steiner box. Thank you for shopping with us. Love the design and the price is right for me.